As part of the Maoriland Film Festival, schools were invited to make their own short films for the E Tu Whanau Rangatahi Film Making competition with the best 11 films presented at Nga Purapura during the six day festival. The student film makers came from schools from Porirua to Turangi, who had attended a two day film workshop in February. Following the workshops they had three days to plan, film and edit their own short films before submitting them for judging at the Maoriland Film Festival. The festival judges were Mike Jonathon and Darrin Haimona. Quite a few portrayed bullying and its consequences, some around family, a couple of horror stories, the environment and our food chain also. “What we’ve seen today is excellent, marvellous,” actor and presenter James Rolleston told the students. He played the role of Boy in the Taika Waititi film of the name and the 2014 films The Dark Horse and The Dead Lands. “All these films, they’re really great to see,” actor Laurence Makoare, who had a major role in the film The Dead Lands, said “Everyone’s a film maker, anyone of you can start making films. The story telling is ours, it belongs to us.” The workshops were held at Hadfield Hall during late February and were led by some well-known film directors and actors, including Mike Jonathon, Whatanui Flavell, Himiona Grace and Briar Grace Smith. They worked with the students, advising on camera techniques, use of sound and all areas of filming, before the students spent the next three days shooting, editing and completing their own films. 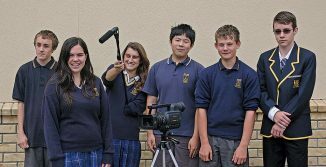 Digital media & drama students at Otaki College in year 11 and 12 became film makers and actors, creating their own short films for the Maoriland Film Festival — E Tu Whanau. After two days of workshops with some of New Zealand’s top film makers & directors, the students had just 48 hours to decide which of the E Tu Whanau values they would use as their theme. Then they had to write their script, decide on the production crew, choose the cast from drama students, decide the wardrobe and any special effects they would use, film then edit — always the hardest part! The World and All Things in It are Treasures, But the Most Treasured of All is Your Mother. This group chose the theme Being a Father, their film title was Take Him Down. Working “outside the square”, the team took up the news items from earlier this year when a young mum was seriously injured while saving an older woman from a handbag snatcher. Actors played the boy snatcher and his sister. The movie theme showed the attack on the two women, but in an inspirational twist — applied to TVNZ to use the actual news film clips of the events and trial of the 17 year old. Then they left the known facts and introduced the father. When they asked TVNZ for permission to use the film clips, the first information received was that it would cost $70 for search fee for each clip plus royalties for every time it was shown! Stephen Aitkin, digital media teacher then rang the television producer explaining what the students were filming for. The reply was “Maoriland Film Festival — go for it!” And they did, producing a very moving short film, which received two mentions at the competition screening with one judge commenting that there could be two firsts. The film received special mention for its use of the actual news clips. The team who produced the film thoroughly enjoyed the experience. “It was a good opportunity for us to get involved in out of school activities.” said Shaniah Sharrem, assistant director. “Just helping out — giving ideas, poses, dialogue: giving the director another perspective.” She would like to be a director screen writer. For sound operator, Claudia Graham, it was putting the microphones around, hiding them to get the background sounds: “best part getting the work done!” For another time, if they had the same crew and were more organised — yes she would be involved “it’s cool doing sound and I’d like to be co-director.” She would also like to be a film producer of a variety of genre. Thomas Able enjoyed being assistant camera man. “Favourite part — being on camera, I guess, I like being camera man.” Thomas was in one scene during the film. Editor, Ethan Dawson had to wait until film was completed before he could do his job, editing the film scenes, the final stage of making a film — deciding what stays and what’s cut to keep the story line moving. “I liked learning about the editing software, it was fun, but not really my scene. I did like the editing,” he said. The week spent at the workshops and filming wasn’t all fun, their work counts towards units for their NCEA Level one papers.